Congratulations on your appointment as NYPD commissioner. Like many New Yorkers, I feel optimistic based on most of your public statements that you’re determined to build on the progress made on public safety in your previous term at the department. I am particularly optimistic that you are determined, at last, to set about reducing the appalling toll of death and injury that motor vehicles exact from New Yorkers every year. I wanted to pick you up, however, on a puzzling statement on January 15 at the launch press conference for the mayor’s Vision Zero initiative. You said pedestrians contributed to causing 73 per cent of pedestrian-motor vehicle collisions last year and that pedestrian actions were directly responsible for 66 per cent of those collisions. It’s a figure that on my reading of the figures is demonstrably incorrect. I fear that, if the NYPD genuinely thinks this figure reflects reality, it could seriously distort the department’s efforts to reduce the grim toll of unnecessary suffering on our city’s streets. I would be interested to know the basis for your assertion – and grateful if you could put the figure right if, as I am sure it is, it is mistaken. Your figure is implausible to start with. It implies that motorists - who stand almost no chance of injury in a collision with a pedestrian, often drive at high speed and are easily distracted – are more solicitous of pedestrians’ safety than the pedestrians themselves. That seems at variance with my experience of human nature as well as with my observation that pedestrians are generally watchful when crossing city streets and motorists often cavalier when driving on them. The statistic is also starkly at odds with all the research I’ve read either in New York or elsewhere on the causes of crashes between motor vehicles and vulnerable road users – pedestrians and bicyclists. For example, a study published in 2013 by NYU Langone Medical Center found that 44 per cent of pedestrians treated for injuries after collisions had been hit in a crosswalk while crossing with the light. Another 6 per cent were hit on the sidewalk. Given that some of the other victims will also have been the victims of driver negligence – hit in unsignalised crosswalks, for example – it is clear the majority of studied crashes were mainly drivers’ fault. A more comprehensive study, published in 2010 by the city’s own Department of Transportation, attributed blame for 36 per cent of crashes that killed or seriously injured pedestrians to driver inattention. It attributed another 27 per cent to motorists’ failure to yield and said vehicle speed was a major contributor to 21 per cent of crashes. The DoT study reinforces the impression that, while pedestrians undoubtedly cause some crashes, they are probably mainly to blame for only a quarter or so of incidents. Around the world, a number of research studies have reached strikingly similar conclusions. Many have attributed blame for crashes involving pedestrians and cyclists to motorists in around 75 per cent of cases. For example, in London, where I lived and cycled for nine years until August 2012, a Transport for London study of every reported motorist-cyclist collision in 2010 attributed blame for around 74 per cent of the crashes to motorists. Motorists’ inattentiveness, excessive speed and impatience are the main killers in every industrialised country of which I’m aware. It's unlikely New York City is a freakish exception. Your assertion also seems at odds with the evidence of the fatal crashes involving pedestrians so far this year. I’ve been able to glean enough information about four of the fatal pedestrian crashes up until Friday 17 to guess how blame might be allocated. In only one – the death of Xiaoci Hu, killed on January 2 when a car ran into the back of another car that had slowed down to let him cross mid-block – does the pedestrian appear to have carried even a portion of the blame. The driver who struck Mosa Khatun on January 5 in Jamaica was charged with failure to yield; the driver who hit Nydja Herring on January 11 in Parkchester has reportedly been charged with aggravated driving while intoxicated; numerous witnesses attest that the driver who killed Cooper Stock on January 11 hit him and his father in a crosswalk as they crossed with the light. Streetsblog, the campaigning website, calculates your department coded only between 7 and 8 per cent of crashes involving pedestrians or cyclists in the first 11 months last year as having resulted from pedestrian or cyclist confusion or error. My concern is that a mistaken understanding of the present crisis’ causes could lead the NYPD to pursue mistaken or counterproductive measures to halt it. If pedestrian behaviour were indeed the cause of most pedestrian/car crashes, it would be worthwhile and effective to work harder at changing pedestrian behaviour. 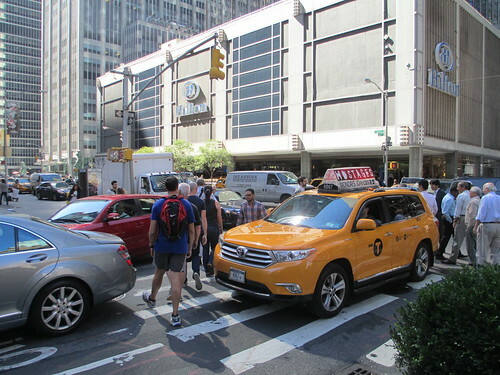 I note there are already reports of a police crackdown on “jaywalking” around the area on 96th street in Manhattan where there has been a cluster of casualties this year. I can imagine it will be tempting for local police precincts to seek in any crackdown to tackle pedestrians and cyclists since they are, by their nature, easier to catch and prosecute than drivers of fast-moving cars. If, however, cars cause the majority of crashes involving pedestrians and cyclists, it will make far more sense to work at controlling drivers’ speed and ensuring they yield when required to do so. 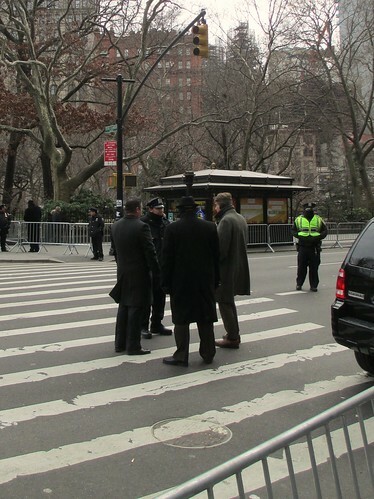 I am worried that, with the crackdown on the Upper West Side, you are beginning to pursue a pedestrian-focused strategy – one that targets the victims and not the perpetrators. My personal conviction is that a concerted effort to tackle the traffic crisis’ real causes could yield dramatic results quickly. During my nine years in London, I covered transport issues in the UK and elsewhere for the Financial Times, winning several awards. London, which has a similar population to New York’s and similar traffic volumes, suffers only half the annual traffic fatalities that New York does. Motorists’ adherence to speed limits and other road rules is noticeably more lax in New York City than in London. 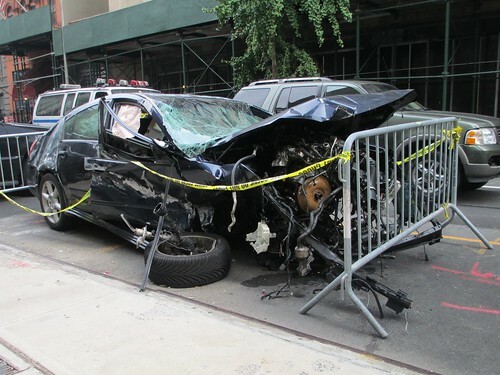 I see no reason why the introduction to New York of systematic speed enforcement and a general culture of respect for road rules should not quickly bring New York’s fatality levels closer to London’s. I look forward to hearing from you about your figure’s origin and how it is affecting your policies. I would of course be delighted to speak with you or your officials about my concerns. It was one Saturday in November that I happened upon one of South Brooklyn’s most thoroughly dysfunctional streets. 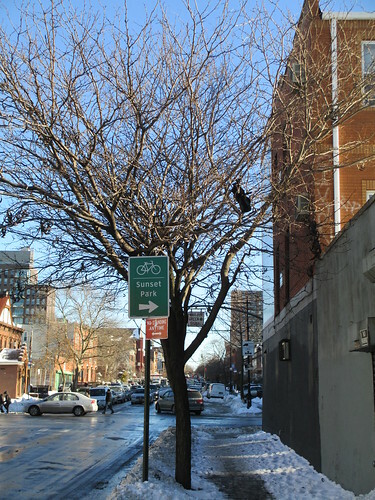 Seeking to take the Invisible Visible Boy for a trip to Brooklyn’s shorefront greenway, I naively followed the cycle route signs pointing me down Brooklyn’s 3rd Avenue towards the waterfront bike path. But, after a little while, as I rode southward with the boy behind me on his trailer bike, we found ourselves grappling with high-speed traffic heading onto and coming off the highways around us. Sunset Park (via traffic dystopia). Then, as we rode into Sunset Park – a stretch of Brooklyn along New York’s harbour front, looking across to Staten Island - 3rd avenue plunged into the shadow of the Gowanus Expressway. The din of overhead traffic always in our ears, we found ourselves constantly buzzed by high speed vehicles or cut off by cars turning into or out of auto repair shops. The street seemed like as complete an example as one could imagine of a street designed for motor vehicles with no thought for human beings. New York City was insufficiently grateful to him. So it was a shock when I discovered that, until 1941, 3rd avenue in Sunset Park was the heart of a thriving community. The street was famous for its restaurants and the food shops that supplied the area’s people – who were mainly immigrants from Norway, Sweden and Finland. 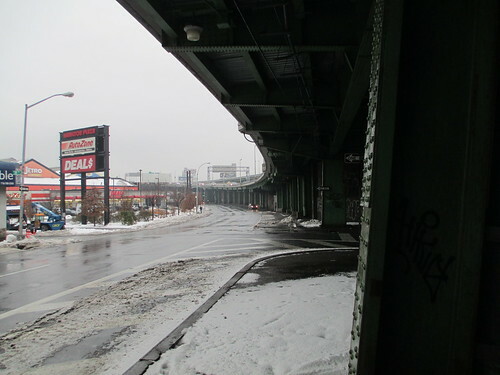 According to The Power Broker, Robert Caro’s classic biography of Robert Moses, builder of much of modern New York, it was only in 1941 with the opening of the Gowanus Parkway - since substantially widened and turned into an expressway - that it started the decline into traffic-dominated squalor. Moses insisted, despite pleas from the residents, on building his parkway above 3rd Avenue when it would have done far less damage above 2nd avenue, nearer the already industrialised waterfront. Moses dismissed the poor but proud community in Sunset Park as a slum and consequently not worth saving. I’ve been pondering the Moses story particularly intensely recently as I've noticed how often powerful individuals shape places’ urban fabric – and particularly people’s ability to get around those places easily and safely. That’s in part because of the end of the term in power of Michael Bloomberg, mayor of New York for 12 years until December 31, and the start of the term of Bill de Blasio. 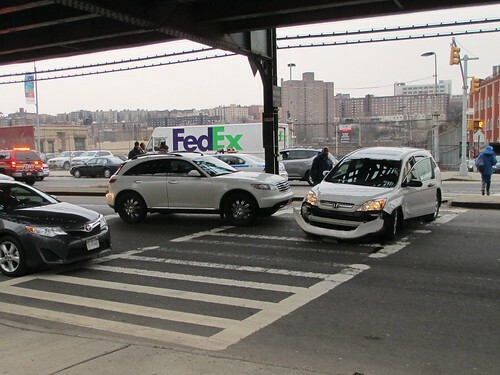 Bloomberg’s transportation commissioner, Janette Sadik-Khan, pushed strongly for the introduction of new, better bike lanes and pedestrian plazas, chipping away at some of the damage Robert Moses did by making the city so dependent on cars. Bloomberg’s successor has promised to continue making decisive changes on the city’s streets. 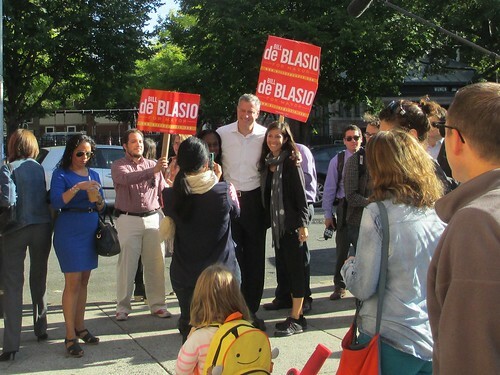 It was part of his election platform – and critical to winning his endorsement by StreetsPac, the safer streets action group – that he promised to work towards eliminating pedestrian deaths altogether. the world's biggest political plaything? In London, it’s becoming steadily clearer that the efforts of the mayor, Boris Johnson, to provide both better cycling and walking conditions and faster journeys for motor vehicles are collapsing under the weight of their internal contradictions. In Toronto, it’s one of the emblems of Toronto’s general civic tragedy that its clownish, crack-smoking mayor has ripped out some important cycle lanes. Over the past week, I’ve been watching how political operatives in New Jersey used traffic congestion to punish the mayor of Fort Lee, a small town by the George Washington Bridge, apparently for supporting the wrong candidate in the state’s gubernatorial election. Taken together, the various cases illuminate some core principles. It’s important that leaders have a clear vision for how they want their cities’ transport systems to work and that they’re prepared to tackle forthrightly the kind of obstructionism that almost any significant change to the urban fabric creates. But it’s also vital that those plans are based in a real, solid understanding of what’s going on at street level, that they’re flexible when there are serious concerns and that the plans are carried out within the rules of the political game. Leaders need to exercise the self-discipline to put long-term policy goals ahead of the need to have concrete successes to show before the next election. Moses – who wielded power over aspects of transport and planning in New York State and City in various forms from 1924 to 1968 – provides the most spectacular examples of what can go wrong. 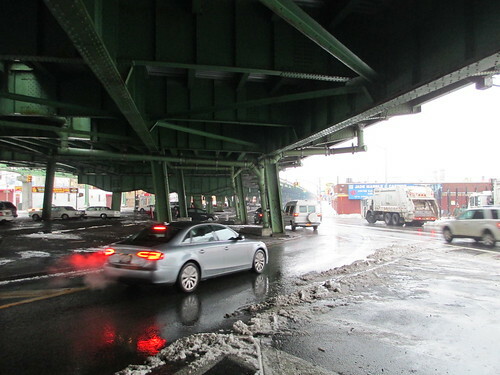 In Sunset Park, he pushed the elevated highway down 3rd avenue because, he claimed, the existence there of structures supporting a recently-demolished elevated rail line would make construction along the avenue cheaper. But that probably wasn’t as decisive as his simple conviction that the people of Sunset Park were dispensable. It’s a principle he followed all over New York City and State when he encountered people or environments for which he didn’t care. The more one knows about Moses, the more one spots around the city problems – whether clogged, disruptive freeways, crumbling subway lines or ugly, unsuitable public housing projects – that could have been avoided if Robert Moses had been made to obey the same rules about planning and due process that others followed. 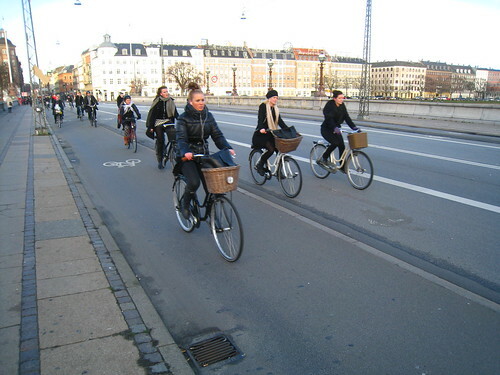 Copenhagen are good, effective public policy. On a far smaller scale, Boris Johnson’s initiative in London to build “Cycle Superhighways” along main roads exhibits a Moses-like deafness to criticism. No cyclist shown plans for the “superhighways” – which are mostly simply painted blue strips along frighteningly busy roads – could have avoided concluding that riders using them would be terrifyingly vulnerable to the neighbouring traffic. The desire to have achievements to show in the mayor’s first term and a wish to devise a cycling policy distinctively different from that of Ken Livingstone, Boris Johnson’s predecessor, seem to have trumped any urge for mature reflection, however. Livingstone had developed the London Cycle Network of quiet routes along back streets. The Cycle Superhighways look embarrassingly inadequate when compared with the bike lane that Janette Sadik-Khan championed around a mile away from the worst of 3rd Avenue, along Prospect Park West in Park Slope. The two-way protected lane illustrates, partly, the value of clear thinking and good planning. The lane wasn’t built by pretending, as Boris Johnson has with the Cycle Superhighways, that bike facilities can be built with no effect on motor cars. It took away a lane of car traffic. Sadik-Khan, who had a strong record of listening to the community boards that provide New York neighbourhoods with a voice on planning issues, defended the decision to build the lane in the face of legal action that has now rumbled on for years but served only to highlight how well worked-out and widely supported the original policy was. Her stance puts Boris Johnson’s insistence on following incompatible goals in his roads policy to shame. before politicians realised the scene's full potential. Boris Johnson, however, has at least largely avoided the ultimate transport policy error – of taking steps for purely short-term political reasons. 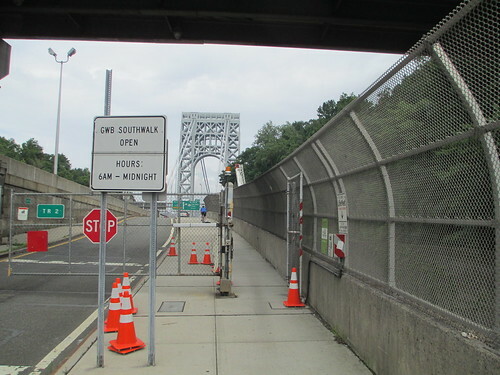 Those seem to have been the motives for the closure for four days starting last September 9 of two of the three access lanes from the town of Fort Lee, New Jersey, onto the busy George Washington Bridge to New York City. An official in the office of Chris Christie, New Jersey’s Republican governor, seems to have ordered the closures to choke Fort Lee with traffic after the town’s Democratic mayor endorsed the Democratic gubernatorial candidate, Barbara Buono. The incident – which held up school buses and emergency vehicles, as well as thousands trying to get to work – was one of the most serious moral failings of transport policy practice I’ve ever come across. New Jersey appointees on the board of the Port Authority of New York and New Jersey, the bridge’s operators, seem entirely to have lost sight of the reason for the bridge’s existence and seen it purely as a political tool. Bill de Blasio fortunately seems unlikely ever to lapse into such downright political cynicism. It was in a supportive spirit that I and some other people concerned about road safety turned up outside his inauguration ceremony on January 1 to remind him of his commitment to cut road deaths. There’s a clear sense of optimism abroad that Mr de Blasio and Bill Bratton, his new police commissioner, might have the courage to start tackling New York City’s appalling road safety record – at the time of writing, the city has already suffered nine traffic fatalities this year. Polly Trottenberg, Sadik-Khan’s successor, even came out ahead of the inauguration to talk to the Vision Zero activists and to hear the heart-rending stories of some of the bereaved parents who were there. But, however optimistic the mood on January 1, I couldn’t help wishing I’d been able to take Mr de Blasio with me on the trip I’d taken the previous day, for a family trip to the New York Botanic Garden. 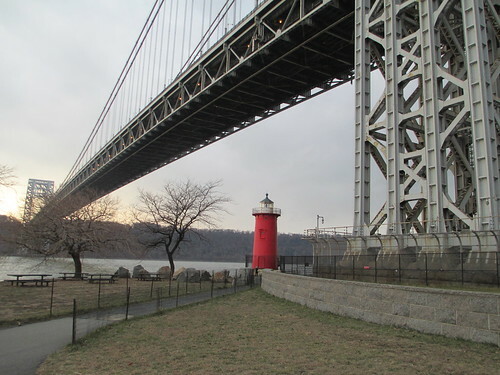 To get to the garden, more than 20 miles from my Brooklyn home, I rode up by Robert Moses’ Hudson River Parkway, taking in how it had cut nearly all western Manhattan off from the city’s stunningly beautiful Hudson River waterfront. 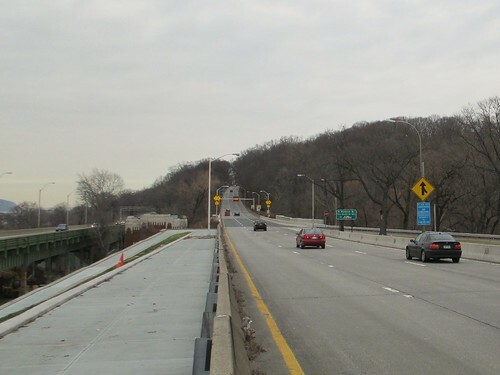 tip, I encountered one of Moses’ most infamous pieces of civic vandalism – Inwood Hill Park, a stretch of primeval forest that he wrecked by needlessly driving a road right through its middle. A scene we would have encountered on the way back would have been just as instructive. On Broadway, by the bridge leading from the Bronx – which Moses’ road was meant to free from traffic – I found a long traffic jam. At its head were three cars, crashed into each other. This, I might have told the soon-to-be-mayor, is the legacy you’ve been handed. It’s a city still reeling from a mad effort to make it almost entirely dependent on the private car - and plagued by regular, serious car crashes as a result.